← Westchester Celebrates Tax Day with Walk & Roll! WHERE: Lake Avondale near the gazebo, Lakeshore Dr. The Avondale Estates Garden Club presents the 3rd Annual Avondale Tree Walk, a conservation project, from 10 a.m. to noon on Saturday, April 23. The event is free, and all members of the public, including children and families, are invited. The walk takes place rain or shine. The registration area is in front of the gazebo, which is just steps away from our “Tree Huggers in Training” talks for children. Other tree talks for adults are also close by. The tree walk will begin after the talks. Arborists and landscape architects will lead six different routes in Avondale Estates. One of those is a walk around Lake Avondale for those who prefer or require a short walk. 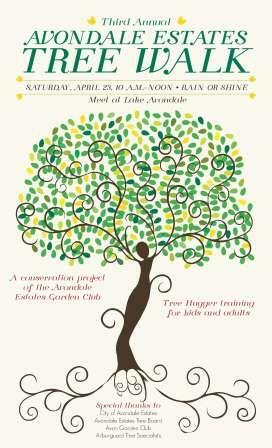 Children who participate will get a picture book from Arborguard Tree Specialists. If Avondale Elementary and the Museum School have at least five students from their school attend the walk, they will earn a book about trees by distinguished authors Gail Gibbons and Patricia Lauber for their school library. All who go on a tree walk will receive a booklet,“75 Native Trees of Georgia,” from the Georgia Forestry Commission. There will also be an opportunity to consult a panel of experts at the “Ask the Arborist Table” about any concerns homeowners have with trees in their landscapes. For more information contact Nancy Martin at iljrd@yahoo.com or 404-373-8165.